The small and pretty harbour town of Fowey is about half way between Plymouth and Falmouth, in a deep valley on the mouth of the River Fowey. The port is surrounded by white, or pastel-coloured buildings giving it a proper seaside air. There are some really charming pubs and cafes with wonderful views of the river and the harbour. Some of the best places to stay in Fowey also have restaurants or bars overlooking this lovely scene. In August there's a yachting regatta which is when the town really comes to life - so book ahead if you want to enjoy the fun. Despite looking like a fishing port, the town actually became wealthy exporting good quality china clay from the nearby pits. This wealth built a lovely 15th Century church as well as some charming buildings. If you're looking for the beach you need to head west to Polkerris beach, known for sailing, paddle-boarding and windsurfing, or else just stroll along the coast until you find a sandy cove you like the look of. Learn about the various fish in our seas at the Fowey Aquarium - you can also handle various creatures including crabs if you're feeling brave enough. Hike up to St Catherine's Castle - a ruined old castle providing spectacular views of the coastline. As we've already pointed out, if you want to book one of the best places to stay in Fowey during the busy summer months, you'll have to do it well in advance. Alternatively come off season, when the village is quieter and you can really appreciate the beauty of your surroundings. Fowey Hall is a 36 room country house hotel specialising in family breaks overlooking the Cornish coast just above Fowey. There's a creche, nannies, activities galore, plus a family friendly indoor pool and spa. Oh, and the views are stunning too. 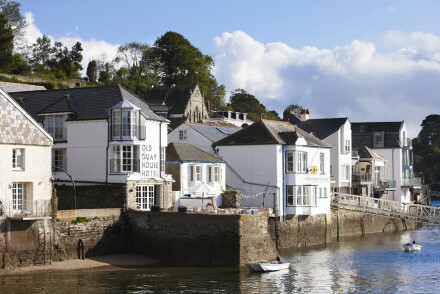 The Best Places to Stay in Fowey for grown-ups! The Old Quay House Hotel is, as the name suggests, right on the quayside in the heart of Fowey's charmingly white-painted harbour. 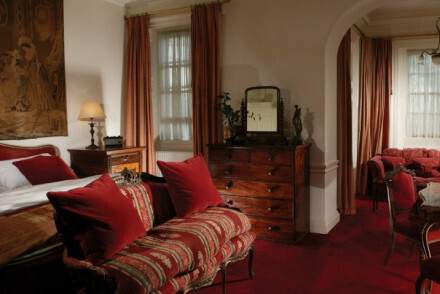 Converted from a lovely old building, it has 11 rooms, contemporary in style with pale colours and colourful artworks. There's also an excellent restaurant which spills out onto a deck in warmer months. The hotel only allows children over 13, so it's a stylish, grown-up spot! If you'd prefer a self-catering option this holiday, don't hesitate to visit our online partner Booking.com for a great range of properties with beautiful views of the estuary. Fly to Exeter Airport located 130km (81 miles) from Fowey. The airport caters to domestic and International destinations in Europe. Catch a train to Par - only 5 miles from Fowey. There are then bus and taxi options from Par to Fowey. Best time to visit - the summer months from June to early September provide typically the warmest weather for enjoying the beaches and various walks. Or you can widen the net and check out all our Cornwall recommendations.